As Paul taught the Areopagus about the God that could be known, he cited two Greek poets who had indicated belief in a supreme being. The first quotation is attributed to the Cretan poet Epimenides. The second quotation is attributed to Aratus of Cilicia, which was also Paul’s home (Acts 21:39). These poets certainly did not have in mind the same God that Paul was preaching, but they acknowledged that there was a supreme power back of the universe. The photo below shows a bust of Aratus displayed in the British Museum. 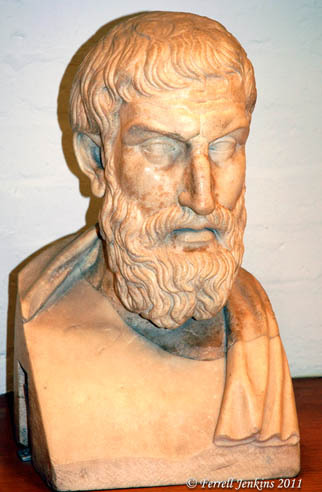 Cilician poet Aratus. British Museum. Photo: Ferrell Jenkins. I am encouraged by Paul`s example that he used what little understanding they had of the truth (they certainly had little likelihood of having seen or heard of God from the Scriptures that Christians had access to). Thanks for the citations and original picture of Aratus.